41k Rolls-Royce-inspired Mini on sale | What Car? Mini has announced details of the Mini Inspired by Goodwood, a special edition made with the help of Rolls-Royce. The car has cashmere-lined roof lining and sun visors, deep-pile lambswool floor mats and Walnut Burr wooden trim on the dashboard and door handles made at the Rolls-Royce factory in Goodwood. The car comes in Rolls-Royce paint Diamond Black and has 17-inch alloy wheels. It is powered by the 184bhp 1.6-litre petrol engine from the latest Mini Cooper S.
Unlike most Minis, the Inspired by Goodwood, comes with plenty of standard kit, including Xenon adaptive headlights, parking sensors, air-con, sat-nav and Mini's Radio Mini Visual Boost audio system with Harman Kardon speakers. 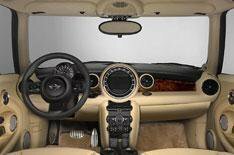 Customers also get Mini's five-year TLC servicing package. Just 1000 of the Inspired by Goodwood models will be made. The Rolls-Royce influence extends to the price tag the Mini costs 41,000. The Inspired by Goodwood makes its European debut at the Goodwood Festival of Speed this weekend.